Tonight is the first of two nights designated for National Moth Night (perhaps more accurately National Moth Weekend) in Britain, which I mentioned in The Moth and Me. I’m encouraging those of us on the west side of the pond to join in, too – why should they have all the fun? – and make this a weekend of discovery, in combination with International Rock-Flipping Day on Sunday. If you missed tonight, you’ll also have tomorrow (Saturday) night to put out your lights for moths. I wouldn’t be much of a promotions person for the event if I didn’t go out there and do it myself, so this evening, despite that the winds were still strong enough to tug at the sheet, and the temperature was 12 C (54 F) at dusk, with a forecasted low of 6 C (43 F), I put out my mercury vapour lamp and white sheet to see what I could manage to draw in. 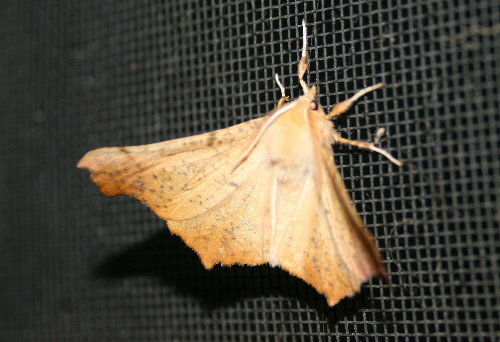 And one hanging out on the screening of the porch, near the porch light. The only other macromoth (taxonomically those usually in the latter half of the field guides or on checklists, and physically, for the most part, the species larger than your fingernail) was this one, a Scalloped Sallow (Eucirroedia pampina). They’re fairly common at this time of year, and I recall even encountering them in the leaf litter of the forest around our house last fall. I had a single crambid grass moth, which are one of the most common moths that you kick up out of the grass when you wade through a meadow. 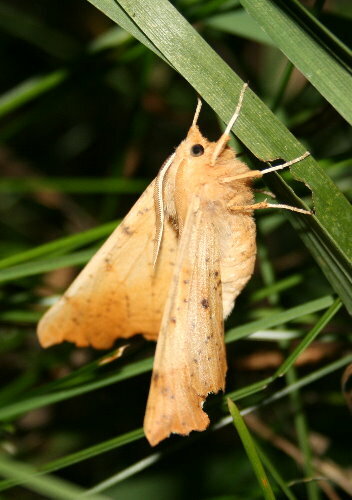 They’re usually seen as small, pale moths that flit away a few feet and then disappear into the stems. They disappear so well because they’re long and thin, and orient themselves parallel with the grass. I believe this one is a Sod Webworm (Pediasia trisecta). 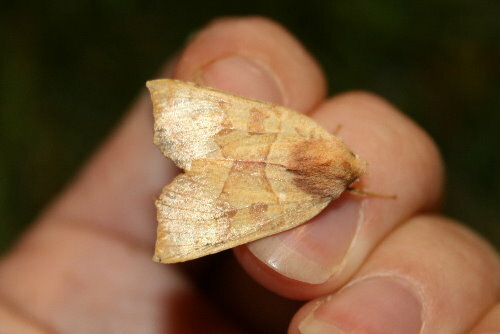 And finally, there were two of these little moths. I don’t know what species it is; I suspect it’s a member of the family Tortricidae, but I could even be completely wrong on that. 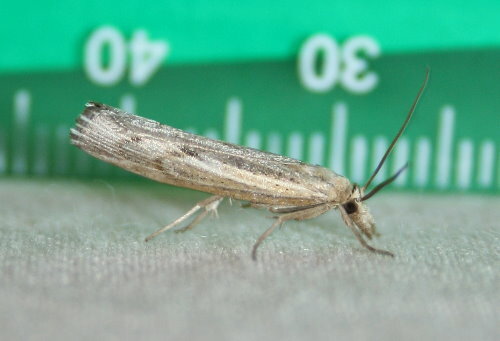 Those little micromoths (this one was less than a centimeter long) are often tricky to identify. 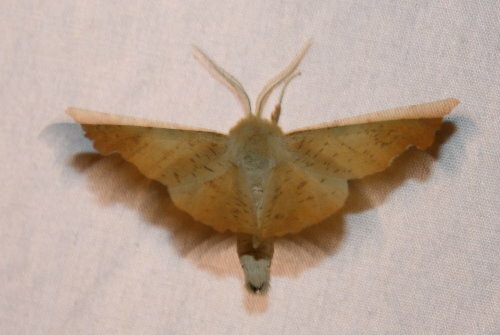 That was it for National Moth Night part 1 – hopefully part 2, tomorrow, goes a little better! But I’m not holding my breath. They’re calling for a risk of frost tomorrow night. Earlier – while scouring for phasmids (having spotted a juvenile the night before) – I happened across a moth akin to that of the Scalloped Sallow. Sadly, no – though certainly not from lack of trying. Hm…pity it’s supposed to be 29*F tonight here! Brrr. 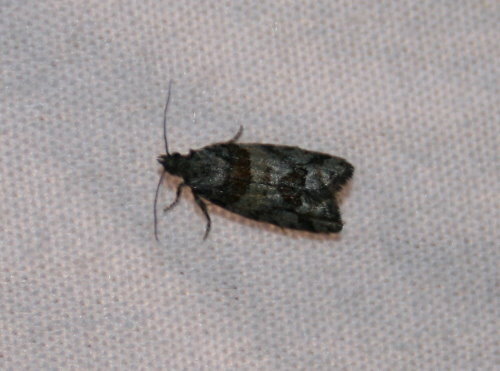 I’d be better off mothing IN the house, where nightly I find moths fluttering around the living room and bedroom! Brr, that is cold, Ellen! Some of the moths that invade one’s house can be interesting.